The VNU University of Economics and Business is going to host the World Finance & Banking Symposium in Hanoi in December 2015. The World Finance & Banking Symposium takes place twice a year to discuss on the issues related to banking and finance in different countries. 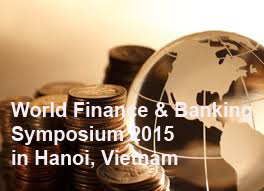 In December 2015, World Finance & Banking Symposium will be organized at VNU University of Economics and Business, Vietnam National University, Hanoi.